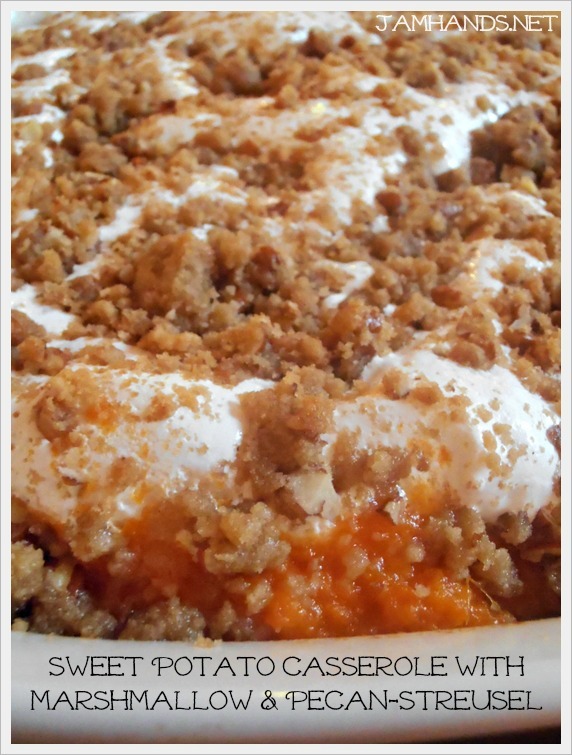 This year we found our favorite sweet potato & marshmallow casserole recipe, courtesy of A Feast for the Eyes. To get the ultra gooey marshmallow topping, we used marshmallow fluff as opposed to a bag of mini marshmallows. Having tried the marshmallow fluff, I prefer it much much more than a bag of marshmallows. The fluff holds up to the heat and has a smooth consistency and nice flavor. Regular marshmallows tend to puff up, then deflate/dissolve, so the fluff overall was a big improvement. 1. Wash 4 medium sweet potatoes and bake them in a 375-degree oven until fork tender, about 30-35 minutes. When they are finished cooking scrape out the flesh into a large bowl. 2. Add the brown sugar, 1 cup of milk, 2 eggs, 1 teaspoon of vanilla extract and 1 teaspoon of salt. With a fork, mash them up a bit. You don’t want to be perfectly smooth. 3. In a separate bowl, add 1/2 cup brown sugar, 1/2 cup chopped pecans, 1/3 cup flour and 3 Tbsp. melted butter. Use a fork to mix thoroughly. 4. 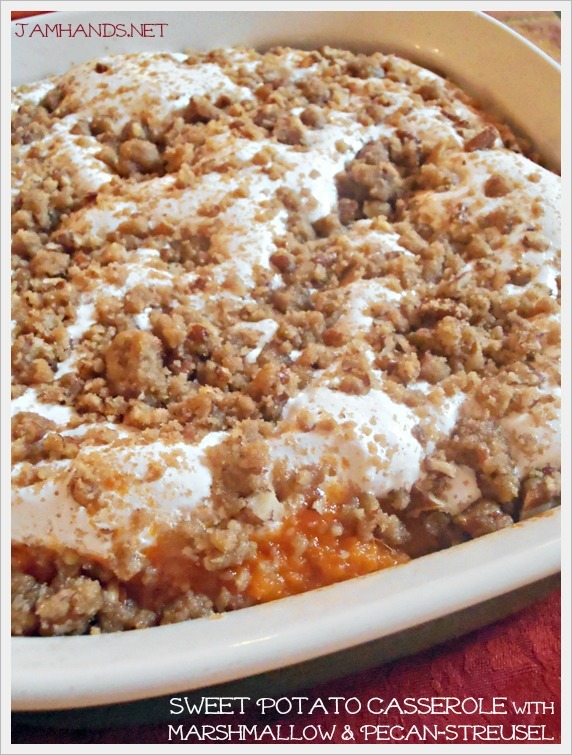 Spread the sweet potato mixture into a lightly sprayed medium baking dish. Add marshmallow fluff, then sprinkle the crumb mixture over the top. 5. Bake in a 400-f degree oven for 30 minutes, or until golden brown. Recipe from A Feast for the Eyes. I make a sweet potato pie with marshmallows, and hate when they disappear. I never thought to use fluff. 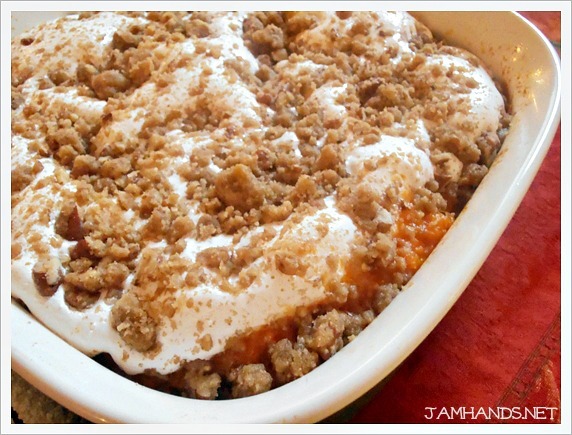 The pecan streusel topping just puts it over the top...Pinning this! Yeah I hate when they disappear as well, along with the texture the melted marshmallows has. The fluff is great, although a tad tricky to work with, but the payoff is worth it. Oh wow, this looks good! It's so much like what Grandma Sanchez makes for Thanksgiving. Thanks for sharing on Recipe Sharing Monday! HUGS! What is the flour for? Do we need to add it? Can this be prepared ahead of time and baked (step 5) closer to meal time? Could you use melted marshmallows instead of the fluff? No I wouldn't try that, go with the fluff. If I doubled the recipe should I increase cooking time? It might take a little bit longer but you should check on it at the called for time and see what you think. I just made this for dinner and it is awesome! I have been vegetarian/vegan for over two years and I tend to fall into a root after a while. I think your blog has just save me from one. I feel like buying a bunch of sweet potatoes in my next visit to the farmers market! Can I substitute canned yams for the sweet potatoes, and do you know how many cans are equivalent to 4 sweet potatoes? Sarah - I think you could but I haven't tried it personally. You would have to mash the canned yams up, either by hand or by food processor. I haven't bought them canned before so I can't speak for how many cans equals 4 sweet potatoes. Google is your friend though, I would try searching for however many ounces = how many sweet potatoes and see what comes up. Good luck! The first time I made this, the fluff and streusel ended up burning in the oven, so this time around, I baked the potatoes first and then added the fluff and streusel afterwards, right before serving. Everyone loved it! Thanks for sharing! That's interesting. I've made this twice and not had it come close to burning. You might try sometime putting an oven safe thermometer in your oven to see if it runs hot. I had an oven a few years ago that burned a lot of stuff, and it ended up that it ran on average 50-100 degrees hotter than what it said. Crazy! Anyhow, I'm glad it turned out well on the second time around. :) I appreciate the feedback. Could you use mini marshmallows instead of fluff? You could but the fluff is much better in my opinion. It retains the fluffiness whereas mini marshmallows will melt and dissolve. Glad to hear that. I make it every year as well. This year I skipped the streusel topping and just did the marshmallow fluff. It was really delicious, smooth and creamy. I appreciate your feedback. Happy Thanksgiving! Can you use skim milk, or does it need to be whole? Do you think I could make this in a crockpot dish?